HR Tech Weekly: Episode #78: Stacey Harris and John Sumser AI in HR: What Are Word Vectors And Why Do They Matter? The fundamental question in Recruiting is not whether you have the best possible candidate, but when you should stop looking. Programmers use an optimal stopping algorithm to determine when you reach this point in your hiring process. John Sumser does the math for you in this week’s feature article, Recruiting Is Optimal Stopping. Today’s recruiting tools rely on historical data for their recommendations. Other systems use Machine learning. As a recruiter, it’s critical to understand how algorithms and AI work in the context of recruiting. Learn how a computer compares one candidate with another in, Basic Prediction Algorithms. 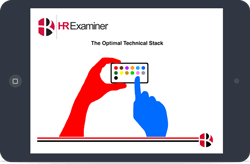 Erin Spencer sits in on the latest episodes of HR Tech Weekly. Episode 77 highlights include Brexit, Snag-A-Job, and how Millennials are having trouble finding full-time work. Episode 78 highlights include The Internet of Things, Phenom People, Beamery, and Microsoft’s clueless recruiting letter. Naomi Bloom’s consulting career spans three generations of HRM software vendors. John Sumser chats with Naomi about her life experience and career on Episode 172 of HRExaminer Radio. Lisa Sterling is the Executive VP and Chief People Officer at Ceridian. On this episode of HRExaminer Radio you’ll learn how she leads Ceridian’s global people strategy while driving the vision for their Dayforce Talent Management offering. As I look more and more deeply into the mechanics of Computational HR (and Recruiting), I am surprised by what I find. The tools and techniques to deeply automate the disciplines are already in place. John Sumser shares some gems from his facebook flow. You’ll find Tesla beta testing their autopilot on the General Public, a curated list on digital learning, or the white paper on Distributed Autonomous Organizations. This week: The Internet of Things, Phenom People, Job Market Maker, Jazz’s partner program, Beamery and their VC funding, and Microsoft’s clueless recruiting letter. Ms. Bloom is a renowned consultant in the HR Technology industry. Naomi has advised large corporate clients on their HRM and HR technology strategies and consulted with three generations of HRM software vendors and outsourcing providers. As an Executive VP and Chief People Officer, Lisa Sterling leads the global people strategy for Ceridian while also driving the vision for Ceridian’s Dayforce Talent Management offering.